The concrete framed structure of this apartment building adjusts to its irregularly shaped corner plot. Exposed beams and columns support lime-washed interiors and a scratched stucco facade forms an abstract expression to the street. 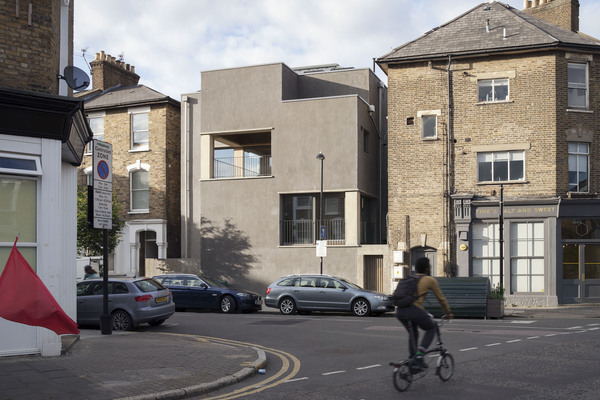 Three apartments nestle tightly into an irregular corner plot in North London, formerly a brickyard, a butcher’s store, a mechanics and clock shop. The client – a restaurateur – briefed the architects with a series of her own photographs depicting the stacking of everyday objects. These in turn prompted an approach based on repetition and adjustment within the odd geometry of the site. Seen from the street, a stucco facade masks the complex unfolding of spaces within. The lime, sand and ash render is hand worked to reveal a slate aggregate, its black flecks giving texture to the abstract façade. Four floors are bound together by concrete columns that rise through the building and help to define the primary rectangular living spaces from which other rooms unfold to fit the site. Each apartment is approximately 100m2, yet each has its own distinct spatial world. 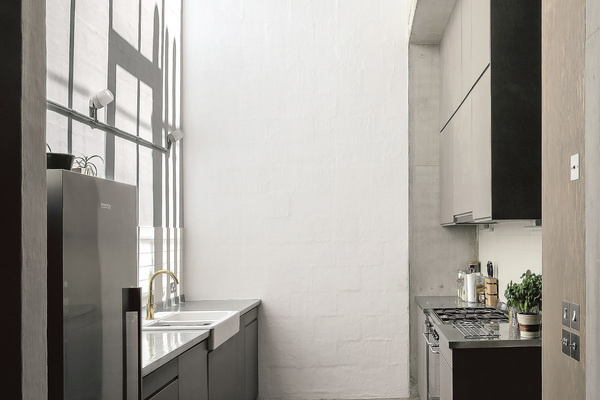 The semi-basement apartment draws daylight into a central living room via a top-lit double-height kitchen and walled courtyards, while the first floor flat provides lateral views through the width of the apartment. The top two floors form a single apartment where the courtyards of the lower floors are replaced with a brass-lined loggia. A double-height living space connects with bedrooms in the roof where a secret courtyard hides behind the parapet. Although spatially individual, the three apartments share common themes, variations of which play out over all four floors. Loggias and terraces form external rooms and large sliding windows allow a diverse array of views – of sky and garden, wider vistas of North London and street scenes below. The concrete frame and slabs are the raw canvas on which lime-slurried walls, Douglas-fir plywood and ceramics add informal texture and warmth. The geometries of Black Stone House required a hybrid in-situ concrete frame that could span in multiple directions. This was left exposed on the inside establishing a material palette of smooth concrete and textured blockwork. The concrete frame is a blended concrete mix using Ground Granulated Blast-furnace Slag (GGBS), a by-product of the steel industry, as a cement replacement. 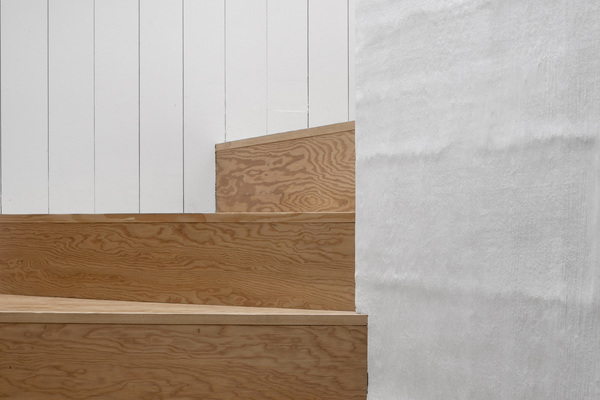 whilst the concrete blocks are manufactured with recycled aggregates such as wood particles. This combination of materials provides a durable, long-lasting structure and the recycled content reduces the building’s carbon footprint. Black Stone House aims to minimise energy use through passive design, efficient equipment, and renewable technology. It has a super-insulated and air tight building skin, which far exceeds current Building Regulation standards. High specification triple glazed timber windows ensure minimal heat loss but bring daylight and fresh air deep into the building. 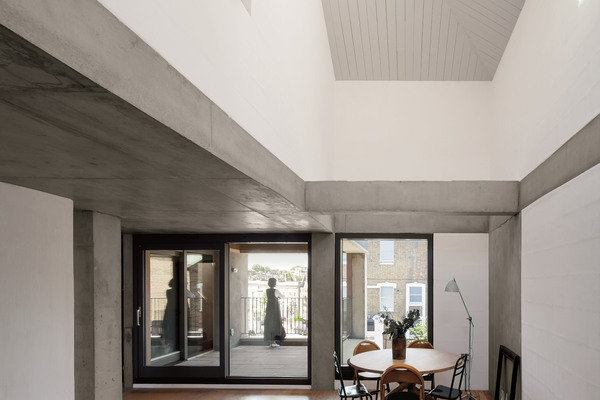 The ‘thermal mass’ of the heavy concrete ceilings and blockwork walls avoids overheating in the summer and negates the need for any form of cooling. Despite the site being restricted in terms of natural light due to the density of surrounding buildings, the apartments benefit from high daylight levels. 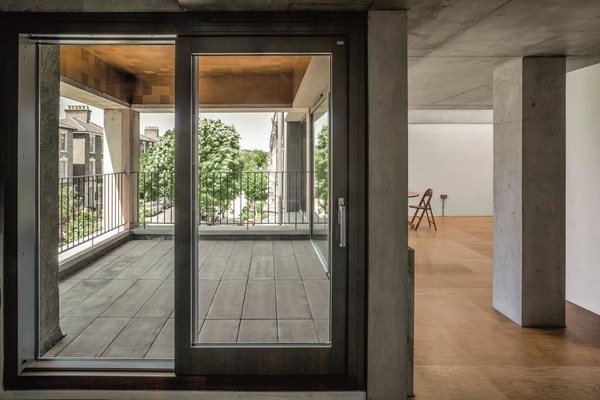 The building’s form has been designed to allow as much light to penetrate the rooms as possible yet avoids overlooking between the apartments and neighbours. The building sets back on each floor to let light reach lower dwellings, where gardens, rooflights and large windows help to introduce light into the centre of the building. Solar energy is harnessed by a large photovoltaic array on the south facing roof. Its position was carefully designed to be invisible from the street, hidden, like much of the house itself.